Clarets boss Sean Dyche has completed his first summer signing. After Kieran Trippier completed his £3.5million move to Spurs on Friday, Dyche moved quickly on a deal for Aston Villa right back Matt Lowton as his replacement. As Trippier signed a five-year contract at White Hart Lane, Lowton agreed three-year deal, with the 26-year-old due passing his medical on Monday. Burnley are expected to pay an initial £1m, rising to £2m with add-ons. Lowton was made available for transfer by Villa boss Tim Sherwood, after dropping behind Alan Hutton and Leandro Bacuna in the pecking order at Villa Park, having made 80 appearances after a £3m move from Sheffield United three years ago. The Chesterfield-born defender, who had a spell on loan with Hungarian side Ferencvaros in 2009/10, was widely admired by Championship clubs, but has decided Turf Moor is his best option. Trippier will be a big loss, following four outstanding seasons with the club, but Dyche has wasted little time in ear-marking a new right back, having said last week on replacing Liverpool-bound Danny Ings and Trippier: “We’re always actively looking at targets we think we can get in. “There’s a couple of things that are already in process now, but it’s not always easy. And while he has Luke O’Neill and young Cameron Dummigan – tipped for a bright future – on the books, Dyche was always going to look outside for a ready-made replacement: “I think there are other players in other positions, but right back we’ve been quite light at. “Once pre-season starts you get so many things going on, that it calms a bit because clubs haven’t got time and have to react themselves. “The summer is usually quiet. Building up to the deadline you get the madness, ‘why didn’t you do that months ago?’ Because those options weren’t available. 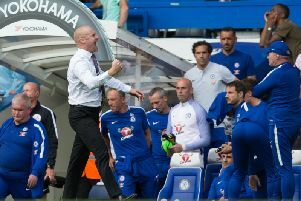 Often managers would want their players in place for pre-season, but Dyche admitted: “We want to have a situation where we’ve got a squad in place that we feel can be productive. “I believed in the first squad I inherited, then I got my own players in which was the summer before the season we went up. “Even though we had lower numbers, I felt it was actually quite well balanced from what we had. “Now we need to carry even more of a balanced squad because we have got more finance available, not just in fees but in wages, so we are looking for that competitiveness across the pitch. “I’d like to have the right people in the right slots however long that takes. “We like the group we’ve got. “Tripps is done, Ingsy’s done, so we know them two for sure. “We’ve still got players behind that.